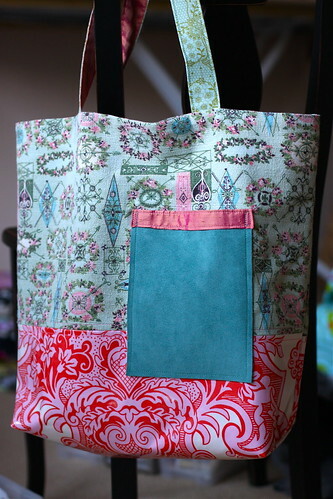 A simple tote bag using laminated cotton for the base. I LOVE this idea, it was the first one that popped into my brain. A perfect ‘set down on the wet ground bag’ for Pacific Northwest winters. 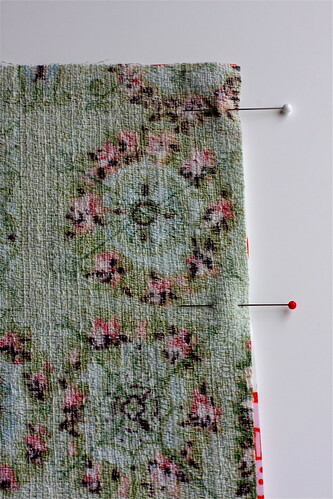 Here’s an example of where I topstitched on the laminate side. I used a #100 topstitching needle. It sewed just fine. A little thumping as the needle penetrated through the coating. The pins will leave holes in the laminate. I used a half inch seam allowance and made sure to pin within that. 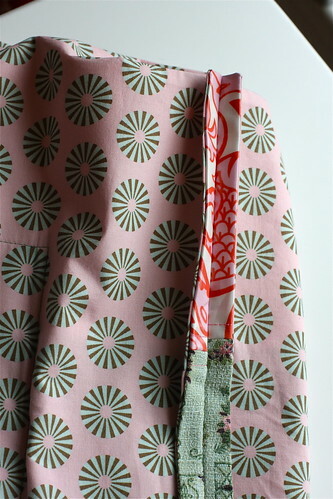 A shot of the inside tote bag seam. As I mentioned in yesterday’s post on laminated cotton sewing tips, the seams don’t really lay flat. In this case it was certainly good enough for the purpose. I like the shape it gives to the bottom of the tote. 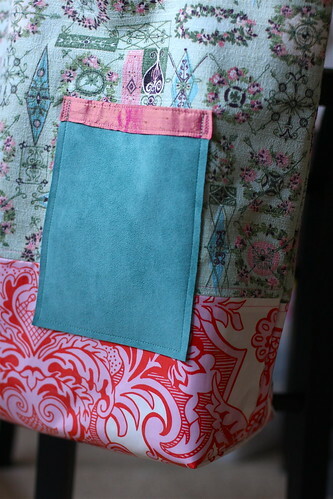 I applied a layer of fusible interfacing to the lining of this tote giving the entire bag a nice structure. The bag stands up on its own. As a side note: I plan to take the straps off this bag and flip them over. 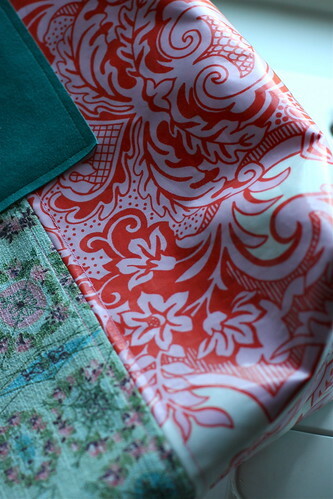 Silk Dupioni was not a good choice as a material to rest against the hand. I like the color and the texture but the material was too scratchy for me! I have a feeling you’re going to ask about that barkcloth on the outside. A vintage eBay find from several years ago. I’m totally diggin’ the old with the new, silk with cotton, and suede with laminate.